The Kettlebell Clean, Squat and Press hits almost every muscle in the body and is a highly demanding full body exercise. 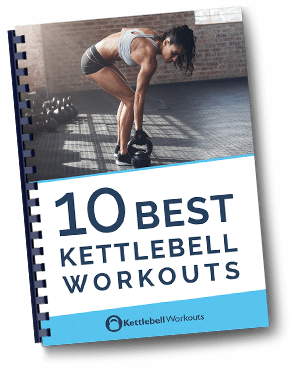 This kettlebell exercise combines first a Kettlebell Clean, then you drop down into a Kettlebell Squat and finally you drive up from the ground into an Overhead Press. Not only will you find the exercise highly demanding on all muscles in the body as well as your heart and lungs but it also gets you thinking. It may help as you perform the movement to think Clean, then Squat, then Press and Down. One of the most common mistakes is not to take the kettlebell down at the end of the movement. Not only is this exercise powerful with one kettlebell but try it with two for a complete workout with just one movement. Greg, my 60 year old shoulders get sore after doing the kb clean and press. Is the clean and push press good alternative for keeping your shoulders health? Hi Ralph, yes the clean and push press will certainly help take some of the stress away from your shoulders. I’ve written more about the Kettlebell Push Press here. Greg Your thoughts on changing to clean,press,and squat? Sounds good Ralph, is there any reason why you don’t want to perform the clean, squat and press in that order? If using a heavier bell it might be easier to press before doing the squat? You should find it easier to squat and press a heavier weight because you can use the momentum from the squat to drive the kettlebell overhead. Thanks for this exercise idea and video. Any tips for stopping the kettlebell from smashing your wrist when you flip it over? 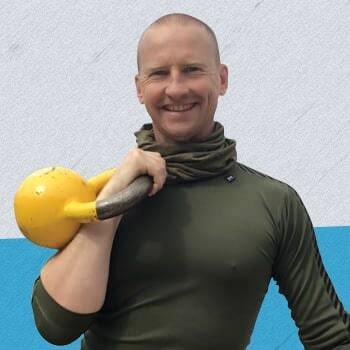 Thanks Andy, yes I’ve got lots of advice on mastering the Kettlebell Clean here. Best of luck. Hello Greg, can this movement be performed with swing in the beggining instead of deadlift position ? What is the difference in effect ? I would stick with the regular vertical clean rather than a swinging clean, you will find there is a much better flow to the movement. Enjoy!